5Rhythms | 5Rhythms Tribe | Nothing More. Nothing Less. A Dance. by Meghan LeBorious, based on an interview with 5Rhythms teacher Tanya Goldman on May 27, 2018, and journal notes from 2008-2019. Tanya doesn’t talk much during class but somehow manages to bring out the best in people. For this Sunday morning class, the big dance studio is jam-packed and notably porous, the many selves melting in and out of each other, part of a big, collective self. As the class begins, Tanya leads us in a long, patient Flowing. She seems confident that we’ll stay with her, even if she doesn’t rush to entertain us. In Staccato and a wild Chaos, I dance with a friend who’s seated in a chair, bringing me down low. I also share several dances with a friend who has been a frequent partner over ten or more years. In contrast to our usual ebullient, wide-ranging partnership, we tuck into a pocket, sustainable, riding energy patiently. In Lyrical, I join with another friend, leaping into flight with my shoulders and chest wide open, tears streaming down my face. At the height of joyful intensity, Tanya plays the 90’s club anthem ’Last Night a DJ Saved My Life with a Song‘. I recognize it immediately, sinking low in a pumping warrior cry as the room explodes. Tanya has a way of doing this. Of building things up and building things up, then dropping the exact perfect song at the exact perfect moment; and if I had had any sort of conscious thought, it probably would have been: This is heaven. Life could not possibly get better than this. I think back to a Heartbeat workshop that Tanya and I both attended ten years before. I was having a joyful and pleasant experience, but it shifted when we were placed into groups of three for an exercise. One person was to move with a certain prompt in mind and the other two would witness the person who was moving, then we would change roles. One of my partners was this very expressive woman who had a huge dance. I had cheerfully joined her in partnership many times during the workshop, but this time when she was supposed to witness me, I didn’t feel like she was seeing me at all. Like she was just totally wrapped up in her own awesomeness. I’m pretty extroverted and don’t feel invisible very often, but somehow this really hurt me. Thankfully, Tanya was my other partner. Curiously, it wasn’t until I reflected later, still nursing wounds from the experience, that I realized that although one partner had failed to see me, Tanya had very much seen me. I realized what a valuable friend she is and hoped that I could return the favor of her clear-seeing, something I continue to try to live up to. Tanya, who has been a 5Rhythms teacher since 2014, sat down with me last spring to share some thoughts on her life and process. We planned to get together after a different Sweat Your Prayers class in the West Village for this interview. I hadn’t really thought through where we would set up but considered a few local restaurants without fully appreciating how much Tanya has to think things through in advance. Tanya has a disability that affects motor ability and uses a walker to get around, so accessibility is an issue, and she also let me know that she is not able to eat solid food. So instead of a restaurant, we went to a smoothie place at the corner, then sat down together at the closest Starbucks. Once settled, Tanya patiently blinked her clear, blue-green eyes, and sipped at her smoothie, inviting the first question. “When did you start practicing the 5Rhythms and what brought you to 5Rhythms for the first time?” I asked. Tanya shared that she went to Oberlin, where Contact Improv was invented, and in fact practiced in the very studio where Contact Improv originated. 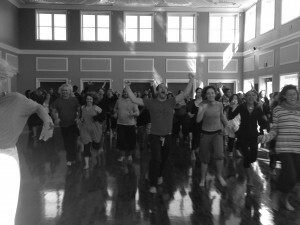 Next, she became part of the Dance New England community and someone there suggested she try the 5Rhythms. She also shared that Jonathan said, “When you do this with Tanya, hold her hands,” and how much she appreciated that Jonathan seemed to get her needs. Tanya and I shared a workshop this weekend that was focused on the 5Rhythms emotional map, Heartbeat. At one point, we were working with the emotion of anger, and the room was explosive. We were instructed to line up at one end of the room and several sets of partners at a time would cross the floor to the other side, expressing the emotion of anger with our bodies. Although I have never discussed it with Tanya, I wonder if, because of her disability, she has to contend constantly with people projecting their ideas of what her experience is and should be onto her. When I was pregnant in 2009-2010, I struggled with the visibility of my pregnant body and how much people wanted to tell me about my experience. I felt like a walking screen for everyone’s projections, and that if I heard one more birth horror story I might possibly harm someone. She gave a clear “Yes” nod, so I moved behind the chair and pushed her forward. Tanya seemed delighted as I gently zigged and zagged across. My own dance had vigor and specificity, a Staccato I’ve been searching for lately – a self I’ve been searching for lately –especially as my roles in the world become more complex and I step into more positions of leadership. When we were almost to the end, I signaled to another dancer to please take over and she got the message immediately. I ran back to the first side of the room and crossed again, on my own this time, in an individual anger dance, unselfconsciously ferocious, owning my power without insisting on it. The next time across, I asked a mutual friend to join Tanya and me. We were just as wild, zigzagging across both in partnership and as a trio, and changing roles halfway across. I’m sure I benefited much more than Tanya in this exchange, and remain grateful to her for her willingness, courage, and openness. The next and final day of the workshop, when we greeted each other, Tanya took the time to say, “I feel seen.” I recalled my resolution following a Heartbeat workshop more than a decade before to return the favor of Tanya’s clear-seeing when I had felt painfully unseen by one dancer, but seen by Tanya. I don’t know if she meant specifically seen by me, but however she meant it, I looked at length into her light eyes and my heart flooded up. So many of the lessons Tanya teaches me are the ones that we already know deep down but conventionally forget, such as the fact that one of the deepest human needs is to feel seen, and that one of the greatest gifts we can offer is to see each other. “Do you have any advice for new dancers?” I asked as our interview drew to a close. “And do you have advice for experienced dancers?